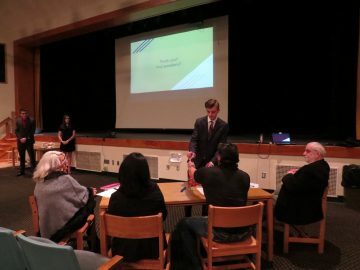 The TJHS INCubatoredu Entrepreneurship Class presented their business models to the Board of Advisors (aka “Friendly Sharks”) as part of the Minimum Viable Product Pitch Day. The MVP Pitch is a critical moment in the INCubatoredu program as the teams of students synthesize their learning into forecasting what their future business plans should be. Each team’s goal is to gain the Board of Advisor’s approval to move forward with their plan for implementation, and ultimately, for funding to execute their MVP plan. This time in front of the Board of Advisors prepares students for feedback and approval and is especially helpful in developing communication skills that lay the foundation for their final business pitch at the end of the school year. INCubatoredu is essentially “Shark Tank” for students and teaches invaluable lessons in grit, determination, innovation and, most of all, entrepreneurship. Congratulations to Mrs. Kostella and all of the INCubatoredu students on their hard work and impressive presentations! TJHS would like to thank all of their Board of Advisors including Dominick DeSalvo, Sean Perich, Christina Weir Ripley and Linda Jo Thornberg for their time, feedback and guidance! Stay tuned for the final end-of-year pitch event in May.